When the iPhone 4S was first released and Siri was introduced it amazed a lot of people. Now, with the iPhone 4S jailbroken, developers are free to extend Siri’s functionality to their hearts content and once again amaze people with the now endless list of possibilities. Including new Siri actions, the ability to control more functions of your iOS device with Siri and the ability to create your own custom Siri commands. Are you looking for Cydia tweaks to modify and extend the functionality of Siri on your iPhone 4S or other iOS device with Spire installed? Well, if you are then you will be glad to know this page is dedicated to the most noteworthy Siri tweaks that are available. It is constantly updated with the latest Siri Cydia tweaks, and is one of the best resources on the Internet for Siri Cydia tweaks. Hit the Facebook LIKE button if you would like to know the instant when new Siri Cydia tweaks and hacks are released. The Hands-Free Control Cydia tweak will allow you to activate your virtual personal assistant by simply speaking out loud “Siri”. The way this Cydia tweak works is by constantly listening for the voice command Siri as a background process. Due to the fact that this Cydia tweak is constantly running in the background it does have slight effects on your battery life, but nothing too outrageous. Another neat feature to this tweak is it allows Siri to prompt you with “Yes?” upon being activated. The SiriToggles Cydia tweak is sort of like SBSettings for Siri. Upon installing SiriToggles you will be able to toggle numerous system-wide settings like Airplane Mode, WiFi and Cellular Data. Additionally you will be able to launch applications, reduce the screen brightness and even check your battery level. The Siri Toggles Cydia tweak will seriously extend the functionality of Siri! The VoiceUtils Cydia tweak will very simply grant Siri the ability to reboot, restart SpringBoard, enter safe mode and power off your iOS device. An additional feature this Cydia tweak provides is the ability to launch applications. If you are just after this feature, however, I would install the SiriToggles Cydia tweak instead. 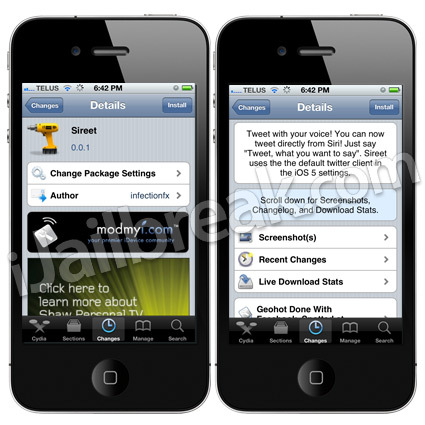 We told you about an upcoming Cydia tweak called Sireet that would allow you to make tweets using Siri on your jailbroken iPhone 4S. If this Cydia tweak sounded like something that would interest you, then you will be glad to know that it has now been released into Cydia. Simply download and install the Sireet Cydia tweak to your jailbroken iPhone 4S, ensure the Twitter is configured through the Settings.app, and then open Siri and speak “Tweet, whatever you want to say.” Sireet will then convert your spoken tweet into text and will automatically make a tweet out of what you just said. You can find it in Cydia through the ModMyi repo for FREE. The Cydia tweak AssistantExtensions, gives Siri much more power than what it has now. It’s not just a tweak, but it is a framework that increases the possibilities of what can be done using Siri. The AssistanExtensions Cydia tweak is based upon MobileSubstrate and can be used to control a lot of things on your iPhone 4S. For example you can tweet, launch apps, set the screen brightness, generate random numbers, toggle system settings and so much more. If you are looking to a Cydia tweak to combine the features of tweaks such as SiriToggles, VoiceUtils and Sireet then AssistantExtensions is the tweak for you! The Lingual Cydia tweak allows you to translate words or phrases to over 30 different languages using Siri. This is extremely useful if you are traveling abroad or simply are dying to know how to say certain things in another language. The Custom Background Cydia tweak will allow you to go into the Settings.app and select an image from your Photo Library or even take a picture directly from the Camera.app to use as Siri’s new background. The Siri Mic Colors Cydia tweak allows you to easily change the Siri mic icon that appears when you activate Siri. For example, you can change the boring old Siri mic icon to a green icon, a yellow icon, a red icon and even blue icon. If you have checked out our Siri Cydia tweaks section above and found you could not accomplish the level of customization you envisioned. You will be glad to know in the Siri Hacks And Mods section below by iJailbreak.com you will learn how to perform advanced customizations to Siri. These customizations often involve SSHing into your iPhone 4S’ filesystem to edit or add files, involve using command line tools on your desktop computer and may even involve other advanced tasks. These advanced Siri mods and hacks, however, will allow you to create custom Siri conversations or create your Siri server (for example). Things that a Cydia tweak could generally not compete with. Thus, without further a due, you can browse below to find some of the best Siri hacks and mods for your iPhone 4S or other iOS Device with Spire installed. Hit the Facebook LIKE button if you would like to know when brand new Siri hacks and mods are released. If you would like to create custom Siri commands and custom Siri conversations then you will be glad to know this is now possible. By clicking the more information button below, you will be re-directed to an easy-to-follow How To guide that will get you started with creating your own custom Siri commands. When you create a custom proxy server for your iPhone 4S you will be able to do absolutely anything with Siri. People have been able to make Siri start their car, control the lights in their house and so much more! Additionally, when you create your own Siri proxy server you will be able to share the functionality of Siri with older iOS Devices using the Spire Cydia tweak. If you would like to get Spire on your older generation iPhone, iPod Touch or iPad you are in luck! Thanks to the Spire Cydia tweak this is now possible. You can get a fully working version of Siri on your iPhone 4, iPhone 3GS, iPod Touch 4G, iPod Touch 2G, iPad 1G and even iPad 2G as long as you have access to a Spire proxy host (either make your own, or buy a spot on a server). UPDATE #1: You can find an updated list of Cydia tweaks and applications available for iPhone, iPod Touch and iPad. Has anyone found or offer a tweak or jailbreak that allows you to customize or change Siri voice?